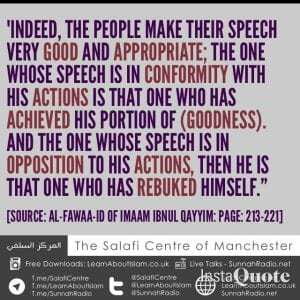 Is Your Speech In Conformity With Your Actions? Some of the Imams said: Indeed, carrying out deeds for the sake of the worldly life is greater [sin] and more dangerous than riyaa [showing off]- because a Muslim can be exposed to riyaa sometimes; as for a person whose habitual [aim] is to [receive] the worldly things and its adornments, then this is grave destruction, and Allaah’s Refuge is sought. 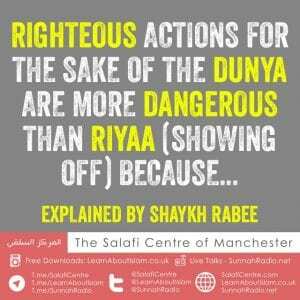 This is a type of shirk [related to the performance of] righteous deeds, which negates ikhlaas [sincerity]. Ibn Abbas [radiyallaahu-anhumaa] explained this as: an individual prays, fasts and stands in the night prayer, whilst desiring the worldly [gains] by way of that- desiring status. All of this is [considered to be] worldly goals; If a person intent [is to receive these worldly things] by way of his worship, then indeed he has fallen into a bottomless pit of destruction, and Allaah’s Refuge is sought. 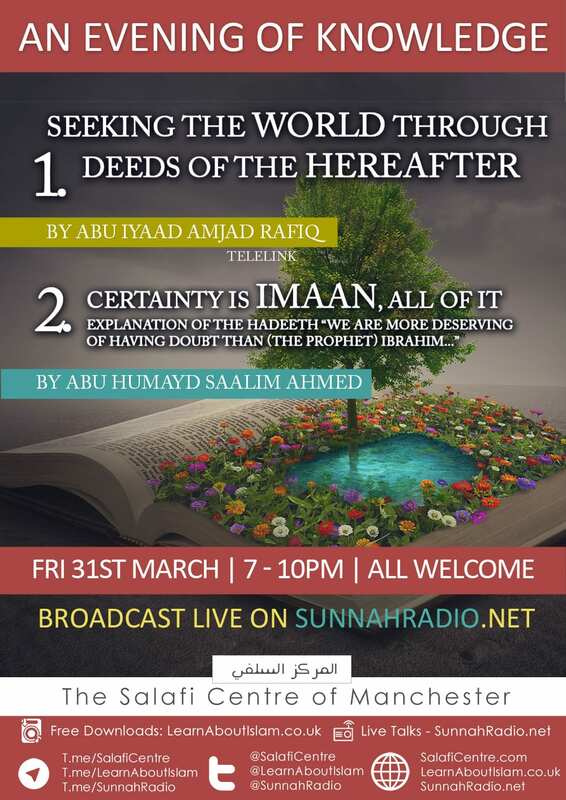 Just as Allaah has threatened nullification of the deeds and [promised] a severe torment for the one who seeks nearness to Allaah outwardly with righteous deeds, whilst desiring the worldly things by way of that. Therefore, take a severe warning regarding those deeds legislated by Allaah through which nearness to Allaah is sought outwardly, whilst the basis of one’s intent behind those deeds is only [to achieve] those worthless [worldly] goals – because in the Sight of Allaah the worldly life is not even equal to the weight of a mosquitoe’s wing. Therefore, how can one make the religion a means to an end to receive these goals and lowly objectives. This Aayah applies to the disbelievers first and foremost, and it applies to the hypocrites and the people of riya [i.e. the show offs], those who do not desire from their deeds and [outward adherence to] Islam, except the worldly things and its adornments, and Allaah’s refuge is sought. The Aayaat regarding this [affair] are many, which clarify what negates sincerity to Allaah in the Religion, [The Blessed and Most High], in Aqeedah and worship. The best of deeds is the fulfilment of what Allaah has made obligatory, refraining from what Allaah has forbidden out of fear of Him and having a truthful intention in [hoping] for what Allaah has with Him [of reward in the hereafter]. The good action is the most sincere and the most correct. He was asked: “Oh Abaa Alee, what is the most sincere and the most correct? Indeed the action which was sincerely for Allah but not correct, is not accepted, and if it was correct but not sincere it is not accepted, until it is sincere and correct. 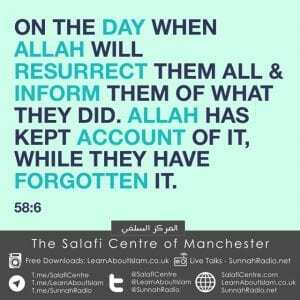 And Sincere (means): that which was for Allah (alone). 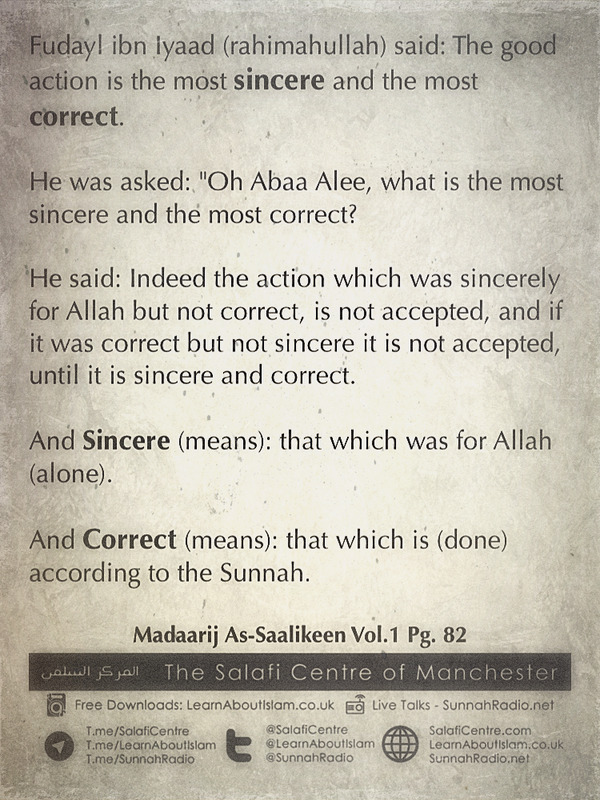 And Correct (means): that which is (done) according to the Sunnah.